Seed policy in sub-Saharan Africa is developing and changing fast, as the seed industry continues to expand its reach. A huge amount of energy and resources are being directed at harmonising seed and intellectual property legislation at the regional level through regional economic communities. Harmonised regional seed laws influence the shaping of national seed legislation, including plant variety protection laws. These are primarily determined by political and economic interests, as private seed companies seek to expand their business ventures into wider markets in Africa. On the other hand, farmer managed seed systems (FMSS), which are the basis of agricultural systems on the continent, are pointedly ignored, undermined and criminalised. This has huge implications for smallholder farms, where 80% of the seed used is from FMSS. These systems feed the continent, ensuring nutrition and supporting livelihoods, and are central to agroecological systems, cultural practices and biodiversity conservation. In a quest to deepen seed policy narratives that support FMSS, the African Centre for Biodiversity (ACB), in partnership with the Zimbabwe Seed Sovereignty Programme (ZSSP), organised a two-and-a-half-day seed meeting in Harare, Zimbabwe. The meeting facilitated the sharing of knowledge and information on the current status of harmonised seed laws and policies in Southern Africa. The theme of the meeting was ‘Towards seed and food sovereignty in Africa: Taking stock of regional harmonisation of seed and plant variety protection laws and developing alternative seed policy narratives that support farmer managed seed systems’. Participants included farmers and civil society organisations from 10 East and Southern African countries, namely, Angola, Lesotho, Malawi, Mozambique, South Africa, Swaziland, Tanzania, Uganda, Zambia and Zimbabwe. An expert on plant variety protection legislation from the Third World Network (TWN) and one from the Seed Freedom Movement were also present and participated in the discussions. The meeting also included key representatives from regional seed harmonisation bodies, such as the Southern Africa Development Cooperation (SADC) Seed Centre and the Secretariat of the African Regional Intellectual Property Organisation (ARIPO). Key issues that stemmed from the discussions included the lack of sufficient information available and the lack of participation and consultation on the development of national and regional laws, particularly with smallholder farmers’ organisations and African civil society. There was a heated debate between the ARIPO Secretariat and civil society organisations (CSOs) regarding the lack of transparency and engagement during the development of the highly controversial and draconian Arusha Plant Variety Protection (PVP) Protocol and draft regulations. CSOs claimed that, over the past few years, they have made numerous substantial submissions to the ARIPO Secretariat and Member States. However, these efforts have been ignored. For their part, ARIPO stated that they have been unable to engage with CSOs, due to the lack of co-operating agreements as required by the Lusaka Agreement, which created ARIPO. According to ARIPO, this situation has resulted in them requesting that CSOs be represented as part of the Member States delegations. CSOs rejected this explanation on the grounds that the situation is discriminatory and not the way in which CSOs organise themselves on the continent. While, on the one hand, ARIPO promised to improve its communication with CSOs, on the other hand, it appears that CSOs wanting to engage with ARIPO will have to request a co-operating agreement. Another burning issue debated was the SADC initiative to harmonise the registration of farmers’ varieties, as contemplated in the Technical Agreement on Harmonisation of Seed Regulations in the SADC Region. While the supposed objective is to recognise commercially viable farmers’ varieties, this raised concerns about who will benefit from registering. Seed is and has always been a common resource, and when it comes to farmers’ varieties, no single individual can claim ownership, especially where these varieties can be found in several geographical areas. Concerns were also raised about biopiracy1. Farmers in the room asked repeatedly what the real objective of registering farmers’ varieties is: how would such a system operate in individual SADC countries, where trade in farmers’ varieties is criminalised? 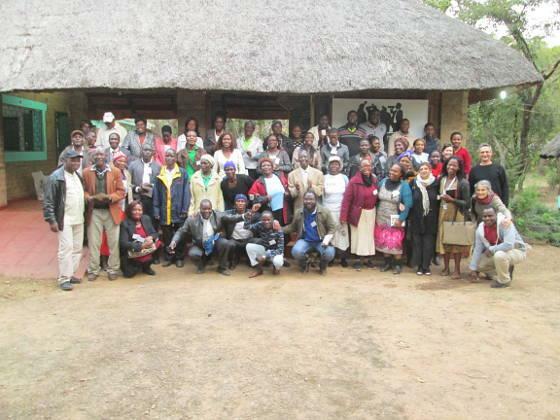 Despite the concerns and challenges, meeting with another group of Zimbabwean farmers at the Fambidzanai Permaculture Centre was a highlight for ACB. Here, participants were treated to a mini seed fair exhibition, a mystica by farmers and a dialogue with the farmers. The seed fair exhibited a treasure trove of seeds, including many varieties of maize, beans, millet, groundnuts, bambara nuts, sunflower, sorghum; the list is endless. It was exciting to see such a wealth of seed, despite the drought experienced across Southern Africa last year – proving that even during the worst crisis, farmers’ varieties are resilient and can continue to support local and national agricultural and food systems. Through the mystica, farmers communicated their manifold challenges and pressures, including appropriate extension service support; exchange of seed among farmers; access to and use of agricultural inputs, such as seed and agro-chemicals; the ever-increasing cost of agricultural inputs; and modern-day agriculture vs agroecology. The question at the back of everyone’s minds was how farmers’ varieties and seed systems will be protected, in light of the current changes to seed policies at regional and national levels. Government regulators responsible for seed legislation from the Ministry of Agriculture were present during the mystica and the farmers’ dialogue and it was great to have farmers and regulators at the same space, in order to discuss together issues affecting smallholder farmers. However, this sort of engagement by the government should also extend to policy development, underscoring the importance of consultation on seed policies, so that these take into consideration farmers’ rights and FMSS. There is no doubt that FMSS do not fit into any of the current seed policy changes at national and regional levels. While some policymakers recognise farmers’ rights and their varieties under the International Treaty on Plant Genetic Resources for Food and Agriculture in principle; however, despite having ratified the Treaty, African governments have not implemented it at the national levels. The pursuit for an alternative policy narrative that recognises farmer managed seed systems and upholds farmers’ rights continues. The seed meeting in Harare and continued civil society struggles for seed sovereignty make valuable contributions to this conversation.